I first shared this image in 2011. 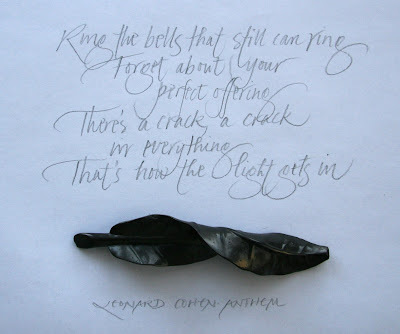 I wrote out the quote from Leonard Cohen's Anthem after the tip of the graphite leaf, which was a gift from my son, broke. I offer it now in tribute to Leonard Cohen. beautiful circularity in your post, susan. thank you. Thanks Leanne. Nice to share it again.